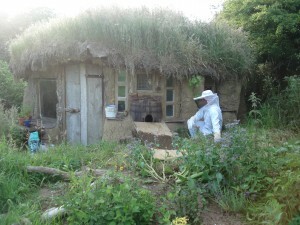 We keep around twenty beehives in an apiary among the brambles. They’re given plenty of space, the occasional spring-clean and health check, but are pretty much left to get on with it. 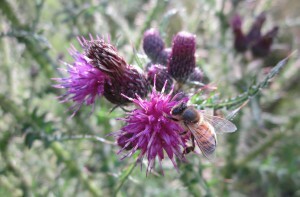 The honey they produce is a magical blend of hawthorn, bramble, knapweed, thistle and many other plants. By the time the bees have been left a generous share, our boys have had their bucketful and we’ve bartered a load for spuds and the like, we don’t always have a huge surplus for sale. The customers we do manage to keep happy have been very kind with their comments though – “honey like it used to taste”, “wonderfully complex flavours”, “top quality” (an ex-buyer for Rowse honey) and “the nicest honey I’ve ever had” (a Pembrokeshire woman in her 80’s). If you’d like to have a taste but don’t come to the south of the county then look out for our honey in Wholefoods of Newport and Happy Planet Green Store in Narberth.